2 bedrooms (1 King, 1 Queen), 2 bathrooms, Sleeps 4. Futon in Maids Room for 1. 2 BLOCKS from METRO LINEA 1 SUBWAY STATION - Santo Tomas. Facing the Bay of Panama and one block to the Cinta Costera. Our condo is decorated with a Modern Flair and equipped with both Light Filtering Blinds and Blackout Blinds in all rooms. The Master Bedroom has a King Bed and a Programmable Safe for valuables. The 2nd Bedroom has a Queen Bed. Both bedrooms have a wall mounted TV with an adjustable arm for multi-directional positioning, Lighting with Dimmer Switches, remote controlled A/C and Egyptian Cotton Sheets for extra comfort. The living area has a wall mounted 55" Smart TV with DVD player, Stereo, High Speed Wi-Fi, Cable TV, Ceiling Fan, remote controlled A/C. In the maids quarters is a Futon that converts into a Full Bed. The kitchen is fully equipped. Gas Stove Top has 6 Burners, Griddle Attachment and the oven rotisserie. We have Stainless Steel Cookware and utensils, cutlery, coffee maker, microwave, toaster, blender. The social area has a Standard Pool and a separate Wading Pool for children, plus Picnic Tables and recently updated Gym. 24/7 Security Guard, gated garage with one assigned space. Small grocery store is located at the entry to the building. Riba Smith a local full service grocery store is only 8 blocks away. El Rey a 24 hour full service grocery store is 2 metro stops away. Alberto and Molly Sasso, are the owners of this property. Alberto was born in Panama. Molly was born in the United States. We met at the University of Maryland. As fate would have it, we moved to Panama and lived in Panama for several years together. We got married in Panama City but, eventually we found ourselves back in Maryland. We now have 2 children, they are 12 and 16. We love Panama! The warm climate, the beaches, the fresh tropical fruits, the fresh seafood, the beautiful flora. Panama is a wonderful place. The majority of Alberto's family lives in Panama, so we visit often. We wanted a place where our family of 4 could stay for several weeks at a time and be comfortable and relaxed. We wanted to be in the heart of the city close to the entertainment and nightlife, but in a well secure location. We also wanted something we could actually live comfortably in if we decide to relocate back to Panama in the future, either as a family or as a retired couple. Welcome to our home away from home in Panama City, Panama. We are 2 blocks from the METRO SUBWAY STATION, Santo Tomas which opened April 5, 2014. We are centrally located with easy access to both the North and South Corridors. So when visiting family who don't live in the heart of the city, we can get there and back quickly. Being in the heart of the city, means a short, cheap, taxi ride to the activities we enjoy. We do live in the United States and we know the standards that most people enjoy. So we took the time and expense to provide those extras that you may not find at other rentals, like Egyptian Cotton Sheets and Towels, Stainless Steel Cookware, Refrigerator with Filter Water and Ice Maker, Coffee Maker with a grinder, a Scale to Weigh your Luggage. Our administrators are actually Alberto's family members. So if you have an issue it's addressed immediately. They take pride in meeting the standards of our renters. The maid has been working for the family for many years and is excellent and well trusted. So if you are staying more than 7 days, her once a week service is included. For an additional fee she can come twice a week. Our 24 hour security guards. They don't work directly for us, but they have truly been a great gift. I get many compliments about them and how helpful they are with taxis and general information. I have a personal Google Map of Panama. Including restaurants, shops, tourist interests, beaches, bookstores, casinos and if you ask about a location and it's not on the map, I will do my best find it and add it on the map. Hence my map continues to grow. Gated with one assigned parking space. Microwave, Toaster, Blender, Coffee Maker with grinder. Stove top has 6 burners and a griddle attachment. Oven has a rotisserie attachment. SAP enabled so programs/channels broadcasting in SAP can be heard in English. 2 Pools, standard pool and a wading pool for children. We have a Concierge in the building. The word in Spanish is used to describe the handyman/helper. If you ask for the concierge Mon-Sat 9-5, he will help carry luggage, carry groceries, carry shopping bags. Please tip him accordingly. Our building has a Shopping Cart located on all the Parking Lobby Floors, you can use these to take your groceries or packages to the condo. Please return it to the lobby when you are finished. We also have suggestions for Chauffeurs that can be Hired during your stay. This is my third stay at this condominium. Good as ever! My husband, 11 year-old son and I enjoyed our stay at the apartment for the most part. The building is located across the street from a great Italian restaurant and near other good dining options. There is a convenience store on the ground floor which is a life saver. The apartment is within walking distance to the Cinta Costera where we enjoyed a nice walk. It is also close to a subway station. The apartment is very clean and has convenient amenities including a washer and a dryer. The beds are very comfortable and the view is very pleasant. Our son enjoyed swimming at the pool and hanging out at the social area. All the doormen were very friendly and helpful. We had no problem getting Uber service in that area. Just keep in mind that you should tell the drivers that you are going to Calle 39 Este and Avenida Balboa as opposed to Avenida Chile (which was stated in Molly's manual). Communication with Molly was quick and she answered all of our questions. She also provided a lot of information about the apartment and things to do in the area. On that note, my suggestion is that instead of providing user manuals there should be simple instructions because it can be cumbersome to read all that information . The only reason why I am not giving this condo five stars is because we had an issue with one of the toilets. It was leaking and constantly making noise. We were also unable to use the toaster because it was not working properly. When I informed Molly about these issues, she said she would get us a new toaster and send someone to fix the toilet. Unfortunately, she did not. My daughter and I spent 2 weeks in this condo and I can't say enough good things. The appliances are new, the water hot, the kitchen stocked with pans etc for lite cooking, the electronics are state of the art with all of the cable channels ( English and Spanish). Several close restaurants, in the same block, several mini-markets to pick up incidentals like juice or milk and a great grocery store about 6-7 block away. The condo has a lovely view of the bay out to the Pacific Ocean, right at the yacht club. The Cinta Costura, walking trail, is right there, with easy access. The price was reasonable, with plenty of security. Choose this place and you will not regret it. We had a wonderful stay in Panama City and the apartment was perfect for us. No problems at all with the stay. The owners were responsive to our needs when the WiFi wasn't working at the beginning. Fixed quickly. The location worked out great. We had a car with us, so we had a parking space and everything. There is a little grocery store in the building that had everything we needed. I would definitely stay here again if we visited Panama City again. Couldn't have asked for anything else. Thank you for everything!!! Lovely unit. Centrally located. Molly was a wonderful host. We enjoyed the neighbourhood. Lots of great food! Very nice place except for the company of the bed bugs ! We rented this apartment for a week from February 26th to March 4th 2018. 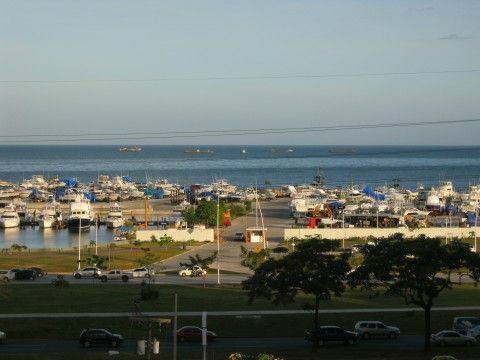 It is well located in Panama City, next to several hospitals and close to the Santo Tomas subway station. The apartment as such is very nice, roomy, has a great view on Avenida Balboa, the ocean and is very well equipped. There is also a nice swimming pool that can be seen from the apartment and can be used. The parking spot is tight, but I have seen worse in my life. Everything would have been picture perfect except that we had bed bugs in the main bedroom on the second day of our stay which forced us to rent a room in a nearby hotel for the remaining four days. The owner has been very helpful and has sent someone to spay the room and the rest of the apartment the morning the problem was reported. The gentleman who came told me the last time he came, it was to spray the other room…My wife was very pleased to learn that ! This being said, we did not have bed bugs in the other room or elsewhere in the apartment and used it for the second bedroom an for our meals. I was hoping for some form of goodwill gesture from either the owner or Home Away, but so far, there is nothing to show for except for nice E Mails. The answer from the owner is that we brought the bed bugs with us. There are no bed bugs residing in our condo. The bed bugs were luggage tag alongs. I have the condo examined and treated on a regular basis for all pests. I have had 2 reports of bugs in the 10 Years we’ve been renting. First time Oct 2016, they were found and reported on day of arrival in the 2nd bedroom. The guest put their luggage on the bed, left for dinner and on return found bugs on the bed. Exterminator was sent out immediately. Exterminator inspected, treated and reported that there was no signs of an infestation of any bugs in the apartment. The exterminator reported most likely the traveler brought them in their luggage. The traveler stayed 2 weeks with no other reports. Second time was Feb 2018 which is the guest making this review. The bugs were reported on day 2 of their stay in the main bedroom. Exterminator was sent out immediately. Exterminator inspected, treated and reported that there was no signs of an infestation of any bugs in the apartment. The exterminator reported most likely the traveler brought them in their luggage. The contracted guest told me the other couple that was staying with them rented another room at a nearby hotel. As a courtesy I offered to cancel the contact and refund them for the remaining unused nights. They said no, because they didn’t find bugs anywhere else in the condo they would stay and let me know if they decided to change their mind. The contracted guest stayed in the condo for the full contracted time. After their stay and once they returned home, they sent me the bill from the other couples hotel stay and asked if as a good gesture would I pay a portion. I said No. The contracted couple found it acceptable to stay. Both couples used the condo for meals and the pool. I’m sorry they had a bad experience. I don’t feel I’m responsible for any added expenses incurred by the one couple who left to stay at another hotel. Note, I have been booked back to back since the beginning of Jan 2018 and no one else reported bugs. I personally stayed in July/August 2017 no bugs. As an extra measure, in March 2018 we purchased all new mattress covers, pillow covers, sheets and pillows for both rooms. Ocean view condo located in Bella Vista, 39th & Ave Chile. Two blocks from the Metro station. One block from Ocean and Ave Balboa across from the Marina and the Cinta Costera. Take a stroll from our condo down the new Costal Belt Park along the ocean front or play tennis, basketball, or take the kids to the playground. We are also within walking distance of the vibrate night life of Calle Uraguay. Walking distance to Children's Hospital and the National Hospital. The building has a 24/7 Security Guard at the main entrance, gated parking garage, and one assigned parking space. Seniors Discount:10% off advertised Rental Fee for ages 60+ with proof of age. 2 nights for $200 per night for a rental fee of $400. Absolutely No Discounts on the 2 night rate. 3- 5 nights for $175 per night for rental fee of $525,$700,$875. Additional Fee for more than 2 guests is charged.